This month I've decided to read the Psalms. I know I've read through various parts of this particular book, but I'm not positive I've made it through the whole. So I choose that. 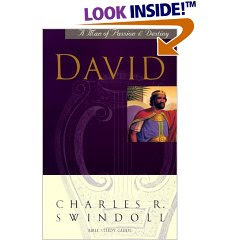 In conjunction with this goal, I intend to read Swindoll's book on David: A Man of Passion and Destiny from the Great Lives Series. I'll post a seperate blog post on my post-reading reflections towards the end of next month. I thoroughly enjoyed Swindoll's book, and have found myself going back and rereading some of the chapters.